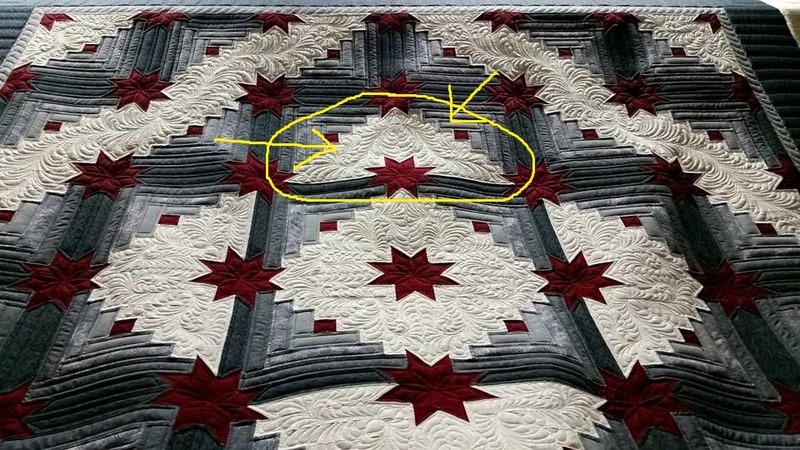 OH MY Laura, that quilt takes my breath away!! Absolutely stunning and inspiring!! You created a beautiful and awesome quilt. That is absolutely lovely. I love the way the straight lines and rolling feathers look. Combo is great together. Can't fine the mistake, but I'm sure its not much that can't be fixed. Your "mistake" stands right out, Really clear..............., as in Mud! I may see it, and I'd ignore. Doubt the owner would ever notice. If so, it is a modesty block. Just send all your mistakes to me. Beautiful quilt and quilting. That is beautiful you did a wonderful job. How did you learn to do such beautiful feathers? I want to learn how to do feathers, I realize it is a lot of practice but how did you learn, is there a book or something I can buy? Thanks for sharing it with us. Beautiful quilting Laura, always stunning.